I bought a license but none of my apps are licensed, what can I do? 2. 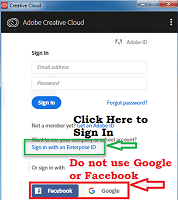 Click "Sign in with an Enterprise ID"
3. 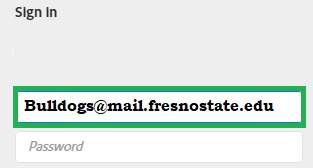 Enter your Fresno State email and click "sign-in". You will be redirected to Campus Login Services. 4. Sign into Campus Login Services with your username and Password. Once authenticated the app will relaunch will fully licensed software. What if I already have a subscription with my Fresno State email? Can I avoid the cancellation fee? 2. Follow the phone tree to make an subscription account change. 3. You will need your Fresno State email address, full name, and telephone number. 4. You will need to state that you are converting to a University Enterprise account and need to cancel your current subscription without a fee. Once your previous subscription is cancelled, follow the normal installation steps to activate your new license. Are there system hardware requirements to use the software? You can review the list of hardware requirements from Adobe's website. Do I need to download the entire Creative Cloud Suite or can I choose my applications? 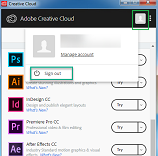 Once you have installed the Creative Cloud Client you will be able to choose which applications are installed to your computer. Do I need to be on campus to use the software? No. The software can be used regardless of location. Do I need to be connected to the internet to use the software? No, once the suite is activated you will be able to use the software on your computer regardless of internet connection. Get help downloading, installing, and activating your Adobe Cloud Software.